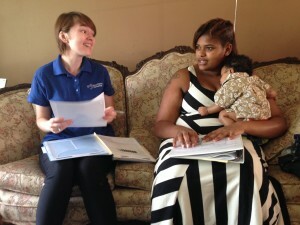 Máire Flood explains different cues babies give for different needs to new mom Jazmin Smith. The two work together as part of the Nurse Family Partnership, which pairs Medicaid eligible moms with a nurse to learn best practices for raising a child. Every week, Máire Flood arrives at Jazmin Smith’s home armed with a scale, measuring tape and binders of information about child development. All of this is used to help Smith raise her three-month-old son, Amiri-Jayden. Flood is a nurse home visitor with the Nurse Family Partnership, an entity of Goodwill Industries that partners Medicaid eligible mothers like Smith with a nurse who helps them through pregnancy up until their child turns two. They talk about everything from what to expect during labor to breastfeeding. Smith says the parenting skills like breastfeeding, reading daily to her son and knowing what developmental milestones to look for aren’t in line with her own upbringing. This philosophy of beginning a child’s education from the time he is born is something child development research supports. A 2012 study from the Center for Early Literacy Learning looked at two groups of toddlers – those who were read to and those who weren’t. The children who were read to developed their language skills earlier than those who were not. The Family and Social Services Administration will select this month the five counties to participate in the state’s new pre-k pilot program, Indiana’s first big move toward making preschool a priority. But many people, like Riley Child Development Center director Angela Tomlin, knows intervention must happen before preschool. Some of these experiences include activities that develop a child’s motor skills and getting them familiar with language through reading. Both which help the child developmentally prepare for school. This is a major focus Flood’s work with Smith and other clients. The Nurse Family Partnership develops its program around evidence, and Flood says the evidence in favor of reading to children is staggering. “They said there’s something like a 500,000 word difference between the babies that aren’t read to on a regular basis versus ones that are,” Flood said. A statistic that resonated with Smith, who now reads to her son every day.